We are engaged in offering of Nutritional Labeling to the clients. 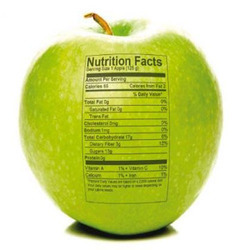 Nutrition labelling is information found on the labels of prepackaged foods.The size of the serving on the food package influences the number of calories and all the nutrient amounts listed on the top part of the label. Pay attention to the serving size, especially how many servings there are in the food package. Looking for Nutritional Labeling ?